I`m going to be honest, the first time I used Avocados to make vegan chocolate mousse I wasn`t convinced. I just couldn`t wrap my head around using avocados for a sweet treat like chocolate mousse. I frist used avocados to make raw chocolate brownies (I`ll post that recipe here at some point) and really loved it. However somethimes you can`t really get rid of the avocado taste. This really depends on how ripe the avocados are. In my experience the riper the avocado the more prominent the avocado taste. At the same time you don`t want very hard avocados for you chocolate mousse but these have the least prominent avocado taste. The great thing about raw recipes is that you mostly use healthy ingredients and that anyone who wants to eat sweet but still wants to be healthy is always going to be on the right side with these recipes. People are always shooked when they find out that Avocados have a hight level of fat and calories. Depending on the size of your raw Avocado it can have about 160 - 240 Calories. But keep in mind that these are healthy fats and calories. They are packed full with Vitamin K, E, C, Potassium and Fibre. Technically a fruit, avocados ofcourse have a range of health benefits. From lower cholesterol levels to better heart function. I get my avocados from turkish markets around Vienna because they sell those large and dark green ripe avocados. The great thing about those unique fruits are that you can use them for so many things. From bread spreads, to salad and not lastly this delicious Cherry & Chocolate Mousse Cakes. 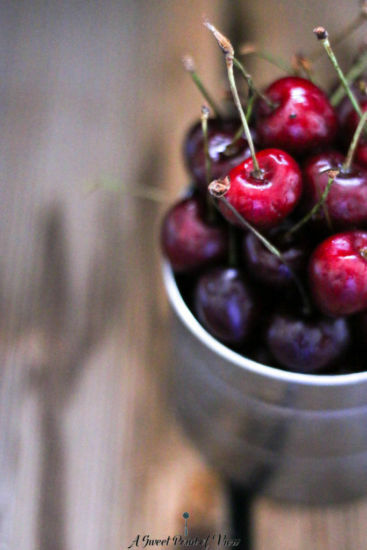 This recipe was made with the first cherries I bought this season. I pitted them and froce a large amount of the cherries. That way you have cherries for weeks to come. Since I mainly buy locally produced and sourced fruit and vegetables contrary to strawberries, austrian cherries hit the market quit early in the season. With Strawberries you have to be a lot more patient. You can also freeze the Cherry & Mousse Cakes for about 2 weeks but ofcourse they taste best when eaten fresh. As always with my raw vegan recipes I used a food processor to make both layers of the cake. I hope you enjoy these little Cherry & Chocolate delights.